No birthday celebration is complete without cake – so I’ll turn on the oven in 90 degree weather for close friends birthdays (Jeb, that’s a complement). I try to pick desserts by what is in season. This weekend, both strawberries and blackberries were on sale at the store so I looked for a recipe that I could incorporate them into. 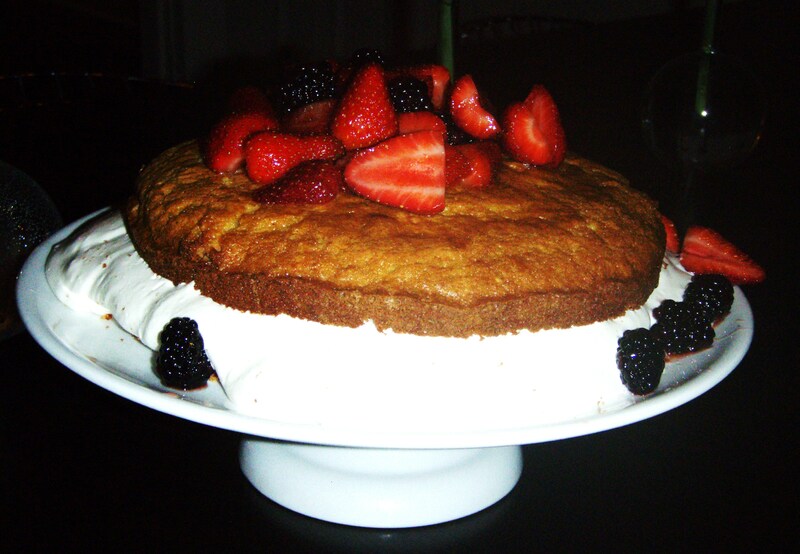 I found this recipe for Marscarpone-Filled Cake with Berries on one of my favorite recipe sites – Epicurious.com. I loved the idea of the mascarpone whipped cream and just had to try it. I didn’t have sherry and used Grand marnier instead – it worked out very well! I sent my Mom the link to the recipe while I was baking and she liked the idea so much that she made it too! She also got the added value of learning from my mistakes. I recommended that she cut the cake normally (without the horizontal opening) and serve it with the cream and berries on the side instead of trying to assemble the cream within the two cake layers – it just squishes all out the sides (see photo). She reported back that this was the best strawberry shortcake she has ever had! I highly recommend this recipe for your summer sweets! Thanks Epicurious! I will definitely accept it with a smile! Thanks for a delicious birthday dinner — one of the best ever! Heather: Hey! (said with indignation) How come Jeb gets his own picture. that looks so good! i’ll have to try this with mike.